All but the sharpest of onions can be mellowed into luscious sweetness by roasting them. A drizzle of flavorful, high-quality balsamic or cider vinegar before serving highlights that sweetness to perfection, but is completely optional. What to do with onions once you've roasted them? They are sheer perfection alongside roasted meats of all kinds, and particularly good to add in with bites of a good steak or nosh in the company of a finely roasted chicken. 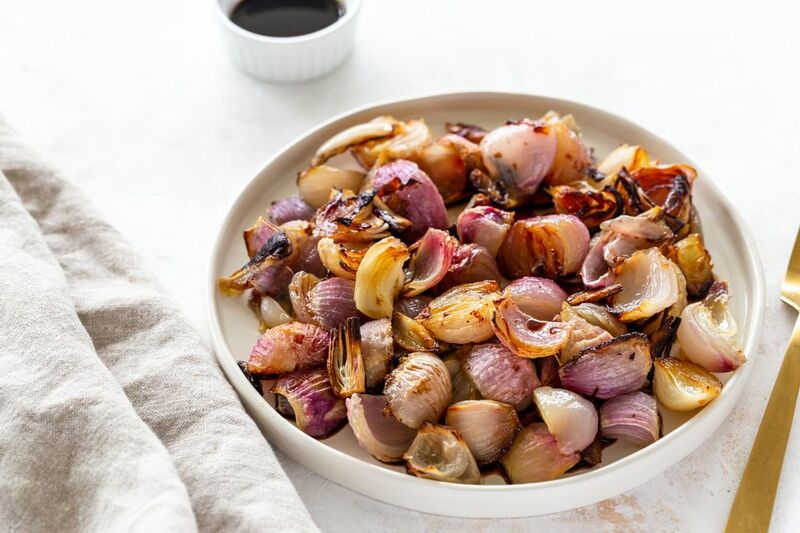 Roasted onions are also a lovely addition to any platter of roasted vegetables—adding an aromatic element to the vegetal gathering. Trim and peel the onions, removing and discarding their stem and root ends along with their papery peels. You can leave the smallest onions whole, but you will want to cut most onions into halves or quarters, depending on how big they are. Bigger than bite-size is fine, but you don't want diners wrestling with giant whole onions that are tricky to cut. Put the onions in a large baking dish (they should easily fit in a single layer for the best, most even roasting). Drizzle the onions with the oil and toss to coat them thoroughly and evenly. If you've cut them, arrange the onions to the cut-side is down, facing the pan (this will help them brown nicely). Sprinkle the onions with salt (sprinkle from a few inches above the onions so the salt falls more or less evenly over them). Bake the onions, turning them once or twice if you think of it until they're completely tender to the bite and browning on the edges - about 30 minutes total. Drizzle the onions with the vinegar before serving, if you like. Start with a smaller amount of vinegar and add more to taste if you like the effect. Set a sprig of rosemary in with the onions, tossing it with the oil and onions and leaving it whole to scent the onions as they roast. Toss a bit when you take the onions out of the oven, so a few of the roasted rosemary leaves fall into the onions. Toss in whole cloves of garlic along with the onions for an aromatic explosion of flavors. Peel them for easy eating and caramelized edges; leave them in their peels for more fully tender roasted cloves. Sprinkle on freshly ground black pepper once the onions are tender (but have another 5 minutes or so to get browned edges and be done) for a pungent kick of flavor. Leave off the vinegar at the end, tossing the roasted onions with a tablespoon or two of minced herbs like parsley, chervil, or tarragon instead. Use shallots instead of onions for an even more subtle final result. Sweeten things up—sprinkle the onions with a tablespoon or so of brown sugar about 10 minutes before they are done cooking.